Chicago Blackhawks legend and Hockey Hall of Famer Pierre Pilote has passed away at the age of 85, the team announced on Sunday. Pilote, who won the 1961 Stanley Cup with the Blackhawks, played 13 seasons with the Blackhawks from 1955-1968, and served as their captain for seven seasons. He won the Norris Trophy three times, and had his number three jersey retired by the team in 2008. 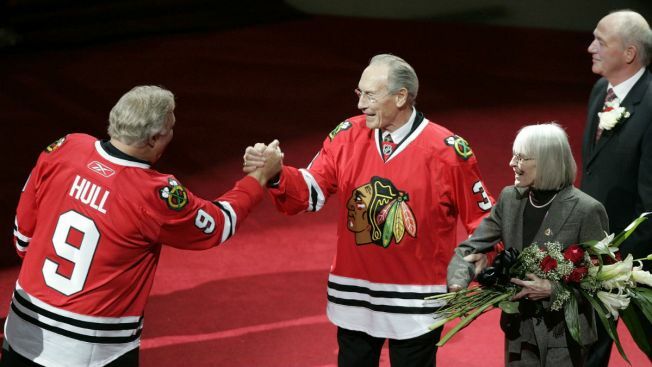 "A mainstay of the Blackhawks' 1961 Stanley Cup champion, Pierre also was a man of humor and great dignity and a proud member of the Hockey Hall of Fame," NHL Commissioner Gary Bettman said. "The NHL mourns Pierre's passing and sends heartfelt condolences to his family, teammates, and many friends." Pilote racked up 77 goals and 400 assists in his NHL career, and he was inducted into the Hockey Hall of Fame in 1975. Pilote leaves behind four children, according to the press release. "Pierre not only helped bring the Stanley Cup to Chicago, he changed the way the game was played and inspired hockey hopefuls the world over," Chicago Mayor Rahm Emanuel said. "Amy and my thoughts and prayers are with the Pilote family, the entire Blackhawks community, and Pierre's many friends and fans on this difficult day."